I heard much about Pisco. It was offered everywhere in Peru. The drink was ok. But I liked Pisco sour very much, it is a great cocktail made from Pisco. How do they lift those 15 tons stones? How they place those stones so neatly? In Sacsayhuaman some stones weigh more than 300 tons! If you are in Peru, you can't miss Pisco Sour. 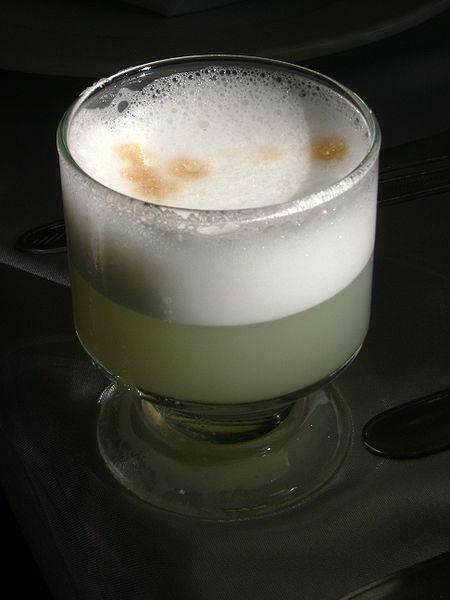 Many hotels offer Pisco sour to welcome their guests. And at any restaurants you will eat, they would certainly have Pisco sour. It is the best cocktail of Peru. So if you are offered Pisco sour, don't hesitate to accept it. Pisco Sour is the National Drink of Peru. Peru even celebrate national day on Pisco Sour. First Saturday of February on each year is the National Pisco Sour Day in Peru. Different place prepare this cocktail in different proportions and with different ingredients. In all cases the main ingredients are Pisco, lime juice and sugar. Other ingredients vary. Blend the ingredients with Ice cube. Blend the ingredients with Ice then spray the bitters at top.